All trains are compatible with other minis sets. Thomas Mini engines just got a makeover to feature your favourite film characters. Belle as Big Barda. Stanley as Black Hand. Percy as Red Tornado. Thomas & Friends Motorized Railway Dieselworks Starter Set Fisher Price 2017 Includes a Motorized Diesel 10 and Carriage With 10 Track Pieces that snap together to make an Oval - The perfect set for beginners on their Thomas adventures!! Requires 1 x AAA Battery (Not Included) For Ages 3 Years . Inspired by the character featured in the DVD, The Great Race, Ashima is a brightly-painted Indian tank engine, who works on the Nilgiri Mountain Railway. She was one out of many engines to participate in the Great Railway Show. All aboard! Hyper Glow Nia features unique multicolour, glow-in-the-dark designs. Perfect, unique addition to any collection of Thomas & Friends. He loves helping out at the Blue Mountain Quarry pulling cargo and supplies wherever needed. With Thomas & Friends™ Adventures, your child and Thomas can go wherever their imaginations take them! AuthenticThomas & Friends product fromFisher-Price. D-10 as The Shredder. All trains are compatible with other minis sets. Thomas Mini engines just got a makeover to feature your favourite film characters. Thomas as Leonardo. Spencer as Rocksteady. Rosie as April O'Neil. Darington is the ultimate showman who loves to dazzle with his daring stunts and tricks! • In every episode, Blaze and the Monster Machines race into high-octane adventures that explore Science, Technology, Engineering and Math (STEM). Thomas Take N Play Along Adventures Trains. Compatible with the new style Adventures trains and carriages. Complete with treasure chest and Thomas Engine. FREDDIE FEARLESS. THOMAS & FRIENDS. COLLECTABLE THOMAS & FRIENDS CHARACTER. SENT OUT IN A BOX. WILL BE WRAPPED IN BUBBLE WRAP AND. Fisher-Price Thomas & Friends Wooden Railway TIMOTHY 8cm Character Engine / Tales of the Brave With magnetic connectors to connect with other Engines (Sold Separately)!! Batteries Not Required - this engine is not Battery Operated For Ages 3 Years / Contains Magnets Please note: All items are sold as pictured and described. They are BRAND NEW in the Brand Manufacturer's original packaging (where applicable and unless otherwise stated - please see listing photos and description above for confirmation). We only sell original and authentic items. Thomas & Friends TrackMaster Toby. Free postage. Thomas & Friends TrackMaster Toby. Condition is Used. I've sanded off some of the moulding underneath as this sometimes catches on Brio wooden track especially on hills etc. Also there is an odd bit of moulding one side that's been like that since new. Dispatched with Royal Mail 2nd Class. Thomas has the very important job of helping to search for the snake. He starts at the top level of the ride and rides down into the snake head. Push the handle and the giant snake ride begins! Thomas is brought back up to the top level to check for the snake again! But how's he going to get down?. Press the lever and a ramp magically appears on the side of the garage so Mickey can zoom down and get ready to race! Your child can bring the vehicle up to Level 2 and press the lever forward to make Mickey's vehicle magically extend into racer mode! Age 3 Condition is New. 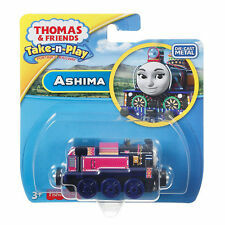 Ashima Die-cast Engine. Ashima is known as the brightly-coloured Indian engine who works in the Nilgiri Mountain Railway. Create your own railway adventures with this motorised Thomas & Friends toy train! Rebecca Engine. For another way to play, kids can adjust the railway sign to send Thomas over the bridge without derailing him. Requires 2 x AAA (LR03) batteries (not included). Collect all your favourite Thomas & Friends characters to build a motorized railway full of Really Useful engines! My First Thomas and Friends Pullback Puffer Fisher-Price 2015 Chunky 9cm JAMES Engine Pull him back and watch his steam cloud puff up and down!! 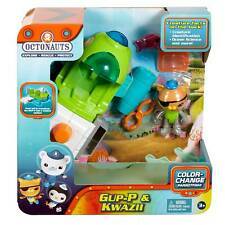 Also Available - Sold Separately - PERCY and THOMAS For Ages 18 Months No Batteries Required . Thomas & Friends Motorized Railway Thomas Starter Set Fisher Price 2015 Includes a Motorized Thomas Engine, plus additional Annie Carriage With 10 Track Pieces that snap together to make an Oval - The perfect set for beginners on their Thomas adventures!! Requires 1 x AAA Battery (Not Included) For Ages 3 Years . Collect all your favourite Thomas & Friends characters to build a motorised railway full of Really Useful engines! CONDITION: NEW WITH BOX SIZE : 10 CM (4") MATERIAL: PLASTIC METAL INCLUDE: TRAIN HEAD BATTERIES NEEDED (NOT INCLUDE) TRACK NOT INCLUDED CAN RUN ON TOMY BLUE RAIL & TRACKMASTER RAIL IF U BUY MORE THAN 5 ITEM, U CAN GET EXTRA 5% ITEM FEE DISOCUNT!! Brand TRACKMASTER MPN Does Not Apply TV/ Film Character TV Character Specific Character Thomas The Tank Engine Country/Region of Manufacture China EAN 27084856675 Age Level 3-4 Years. Fisher-Price Thomas & Friends Collectible Railway THOMAS 7cm Die-Cast Engine With plastic link connectors to join with other Engines Others Available - Each Sold Separately For Ages 3 Years No Batteries Required Please note: All items are sold as pictured and described. They are BRAND NEW in the Brand Manufacturer's original packaging (where applicable and unless otherwise stated - please see listing photos and description above for confirmation). We only sell original and authentic items. Fire Rescue Blaze Die-cast Vehicle. Blaze & The Monster Machines. A perfect addition to any Blaze and the Monster Machines collection. Featuring your favourite characters from the show. 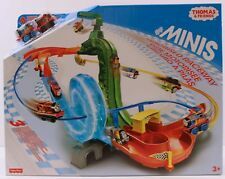 Enjoy full-throttle fun with this Minis Stunt Set! Place the detachable launcher in front of any pathway to Boost and Blast your Minis through one of 6 paths! You can launch up to 3 Minis in a row.